A key factor in successful trades is finding those with the lowest risk entry. In the Japanese yen example below, I have shortened the timeframe, as I understand a lot of users use these timeframes particularly for Forex and intraday trading. 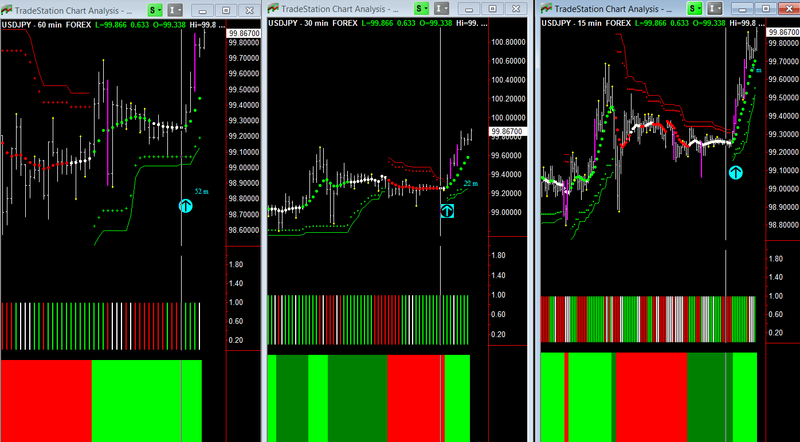 The cyan arrow on all three charts shows that the volume has changed to green indicating where the professionals are buying. The Hawkeye trend has gone long (green on all timeframes) and the Hawkeye Heatmap positive on all timeframes. Hunt for these perfect setups—they apply to all markets and all timeframes. Previous PostPrevious Volume is King When Trading Gold.